Plate anchors are the most economical method for providing support to cracked or bowed basement walls. 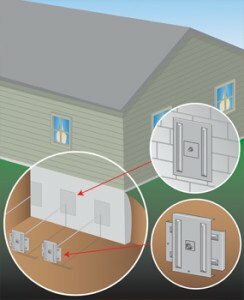 Their simple and effective design allows foundation repair installers to complete jobs quickly and economically. Minimal disturbance to landscaping is one of the many benefits of plate anchors. 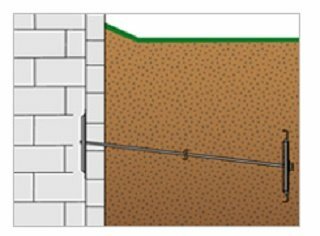 If you have bowing or leaning foundation walls, this is a great solution for you. Contact the team at Reliable Waterproofing & Masonry to learn if this is the right solution for your foundation repair needs. We use plate anchors from Earth Contact Products. These are the very best in the industry. With our expertise and these great products, you will be sure your foundation repair is done right. Cracked or bowed foundation walls are caused by excessive outside soil pressure. This pressure is a result of water buildup in the soils surrounding the walls. As the pressure exceeds the original design strength, the wall will start to crack, bow or lean. Plate anchors are designed to stabilize these cracked, bowed or leaning walls. These anchors consist of an inside wall plate, an outside anchor, and a high strength rod that ties them together. The installation is quick using small equipment and requires minimal excavation, so your landscaping will have little disturbance. Reliable Waterproofing & Masonry uses the best plate anchors made in the industry so you will be assured that once these are installed, they will last for many years. Earth Contact Products (ECP) is the leading manufacturer of foundation repair and basement waterproofing in the industry. With over 30 years of experience and using the best products for foundation repair, you can be assured that the repair will be done right the first time and the wall anchor is the best made in the industry. With our design engineers and the ECP national network of foundation repair contractors, we set the standard for the industry. We are your plate anchors experts!